The benefits arising from the recent addition of H2O GmbH wastewater evaporation systems to the capability available from Lancy Technology, are being clearly demonstrated by Norman Hay Group sister company, SIFCO ASC. 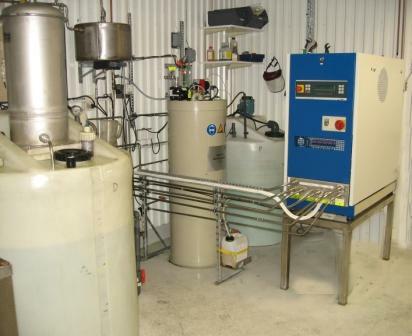 The Swedish factory of the advanced selective plating supplier is reporting significant environmental and performance gains as a result of its use of an H2O Vacudest system. In the UK, Lancy Technology is now able to offer the full range of systems from German manufacturer H2O to its customers. Each unit is based on a modular design which enables it to be tailored to meet precise installation requirements while additional factors such as a maintenance-friendly design and simple control systems, including internet connection for remote diagnostic purposes, are seen as further factors that help to produce the highest quality distillate from each Vacudest facility. “We are delighted to have been able to enhance our services in the UK with the addition of the H2O range for the precise reasons that are outlined by Sifco ASC in Sweden,” says Keith Allen, Business Development Manager at Lancy Technology. “Sifco ASC operates in an extensive market, throughout Scandinavia, the Baltic area and Russia, so the company has a broad client list against which an evaluation of the system can be made. “The results that Michael Olsén and his colleagues are achieving are now directly available to all Lancy Technology customers in the UK. We are confident that this will help us build on the established reputation for high quality wastewater processing that we have developed over many years,” he concludes.